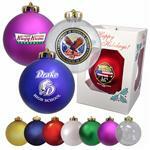 Made in the USA Shatterproof Custom ornaments with your custom imprint! 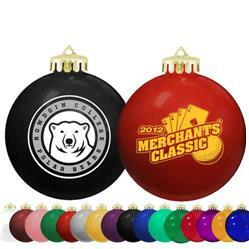 Economically priced, glossy finished, durable, shatterproof ornaments are treasured mementos that will carry your message for years to come. Add your personalized logo or design to show off during the holiday season. A great Christmas or Holiday Gift. Many colors to choose from! Production Times Available: Standard 5 to 7 business days. Inquire for 2-day rush production. Typical Imprint Area(s): 2" diam. Color Print. 2 Sided imprint available. Multi color imprint available at 250 pieces or more. 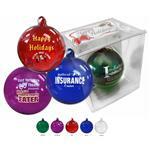 NOTE: Mis-registration up to 1/8" in any direction. .
Shatterproof 3 1/4" diameter ornament. Made in America.